A complete system for the detection of leaks at tea points, coffee stations and kitchens. 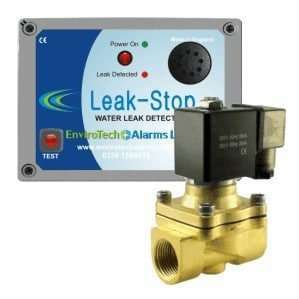 The package includes a LeakStop alarm panel, all connection cables, 3 metres of sensor tape and a 15mm solenoid valve. The tea point water leak detection kit is our most popular leak detection package it has been used in well over 100 locations to protect Teapoints, Coffee Stations and Kitchens from water leaks. Everything required is included in the kits to enable you to install quickly and easily. A LeakStop alarm panel connects to a 3 metre length of sensor tape which can be put under the kick boards or under the floor (if there’s a raised floor) to detect the presence of water. Should a pipe or a fitting leak for any reason, the water will collect on and around the sensor tape. As soon as this happens the alarm panel will sound and show a Red warning light. At the same time a solenoid valve will automatically close, isolating the water to the area and preventing further damage due to water ingress. 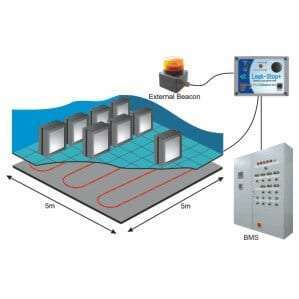 All our tea point water leak detector packages come with a BMS connection as standard. 3 meter length of water leak detection sensor tape with moulded plug and socket. Designed to detect the presence of water at any point along its’ length. 15mm (1/2″) normally open 230VAC solenoid valve used to switch off the water supply to the area. Kit includes 3 metre connection cable to connect sensor tape to the alarm panel. 2 metres of electrical flex to connect to the 230VAC supply. 10 metres of electrical flex to connect to the valve and 5 self adhesive floor clips to hold the sensor tape in position.